Last week I highlighted a poor op-ed from the Washington Post. This article from the New York Times is better, but its headline is well, dubious. 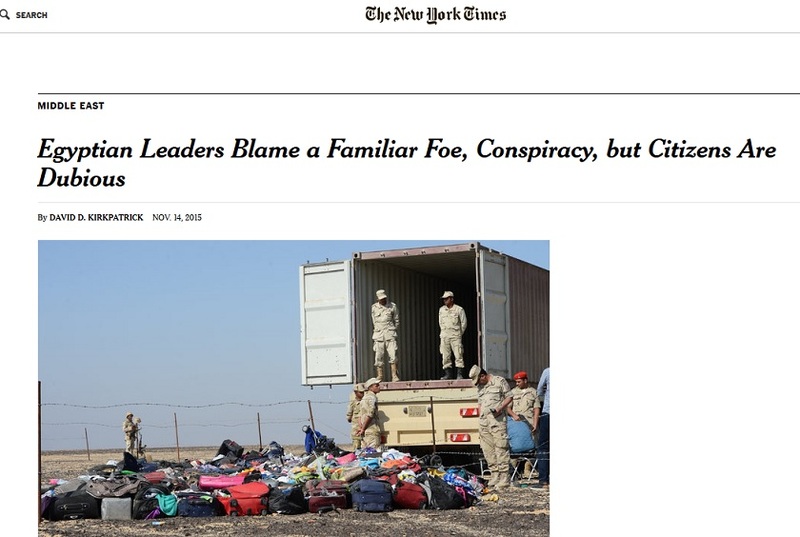 Egyptians do thrive on conspiracy theory, though they should be accorded a degree of sympathy given the troubles and outside influences on their region. Now, writing a headline is almost more art than journalism, sometimes crossing the line into marketing. The author is forgiven, and may not have had say in the final wording. Hisham Kassem is an important voice. As a journalist he should be expected to have his ear on the street. The author does well to quote him, and builds a case against the Egyptian habit of resorting to conspiracy. Unfortunately, other voices quoted are from influential Egyptians outside of the country. They are critics of the regime, and some have fled for their safety. Their voices are also important, but they are not well placed to demonstrate the popular reception of government statements. Lamees el-Hadidi, one of the most popular pro-government talk show hosts, said in a broadcast that the government was compounding the economic pain from the plane crash by scaring away investors with the detentions of a prominent investigative journalist, Hossam Bahgat, and a newspaper owner, Salah Diab. But these voices concern a popular discontent over the economy and to a lesser degree, over rights and freedoms. These are present, but they do not speak to a ‘dubious’ attitude towards either the state narrative or the conspiracies that swirl around. I would say the great majority of Egyptians believe that outside forces are out to get them. And this attitude is shared equally by pro- and anti- regime. And they have good reason. Right after the Russian airline crash, when early speculation imagined a terrorist missile, the UK’s Daily Mail published a story about a British tourist airliner having to take evasive maneuvers to avoid a similar fate. I have no explanation for the article, but it came amid a media frenzy that has now resulted in the restriction of UK and Russian flights to Egypt, crippling the tourist industry. Already struggling for foreign currency, this crisis is estimated to lose revenue of $280 million per month. As Salama Moussa has repeatedly written, Egypt must face up to its self-inflicted wounds and take responsibility for itself. Foreign nations can help. Foreign media has a role to play as well, and the power of shaming – though not appreciated in the Middle East – can be strong. The New York Times article describes well much of what is happening in Egypt. But it would do better with a proper headline, especially one that is better documented. Perhaps nothing the author could have done would have made a difference, but the result among Egyptians is that this is just one more example of Western media misrepresenting it. And sadly, they are not short of evidence that can be similarly construed.